The “Welcome” video walks you through everything you need to start using the GrandPad right away. The smart case turns off the screen when not in use. 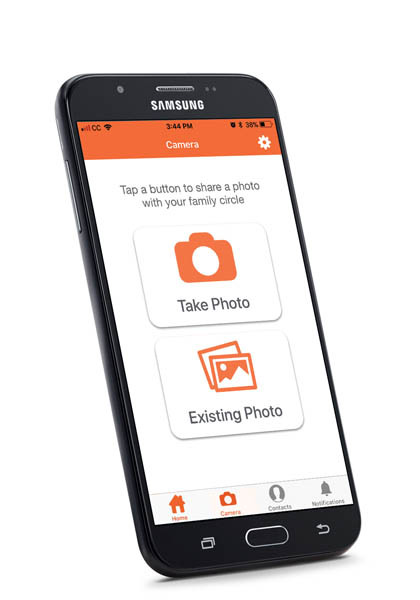 Share photos and videos with your family and friends–enjoy favorite memories with the push of a button! Make calls simply by tapping pictures on the screen. No need to worry about remembering phone numbers! 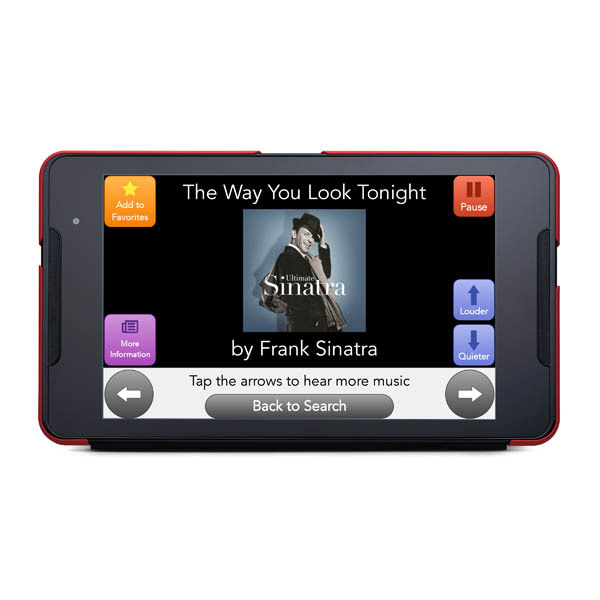 Enjoy your favorite songs by streaming music on the GrandPad. Use your stylus in place of your finger to navigate around the screen. GrandPad includes essential apps that let Mom & Dad connect with loved ones or pass the time productively with a simple tap on the screen. They’ll enjoy the convenience of video chatting with a high definition display and clear volume from the dual speakers. They can browse the Internet, share photos, and send voice or written emails. With popular games, streaming music, curated news, and more, GrandPad offers endless options to stay entertained and engaged. Connect face-to-face! 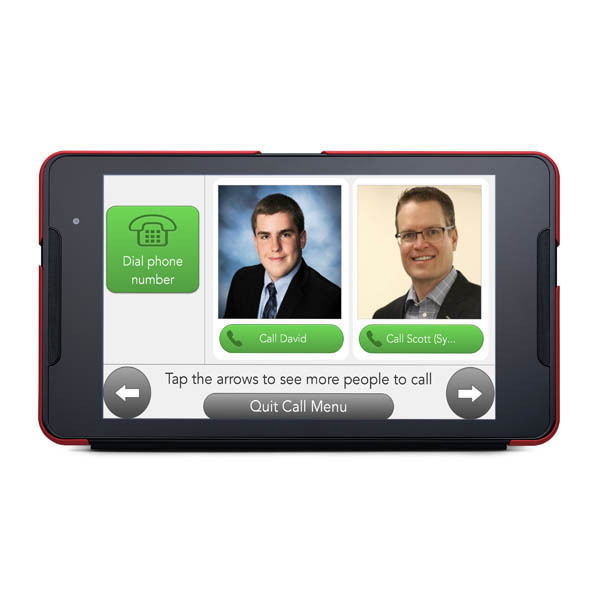 Enjoy video calling with the GrandPad user. Take new photos to share or add your favorites. Social media feeds can be connected so public updates are instantly shared across platforms. Customize your settings and contact information with mobile app. 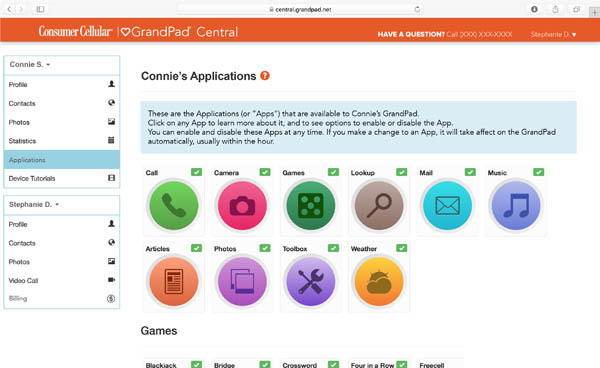 Customize available apps for the GrandPad user from GrandPad Central. 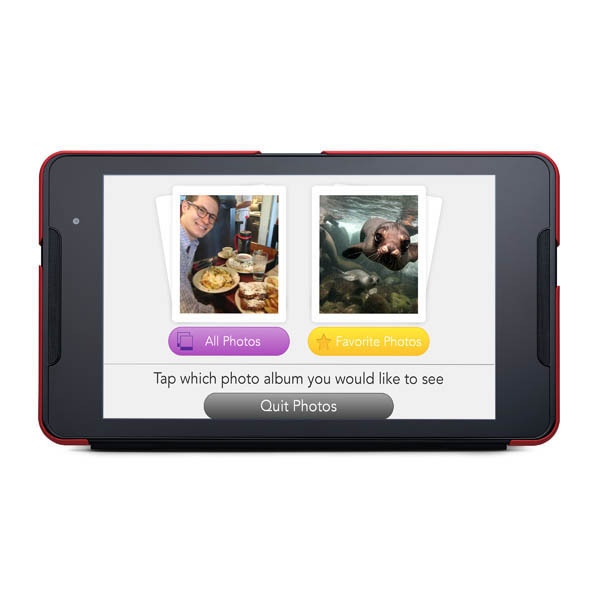 Create an album of your loved ones favorite photos. 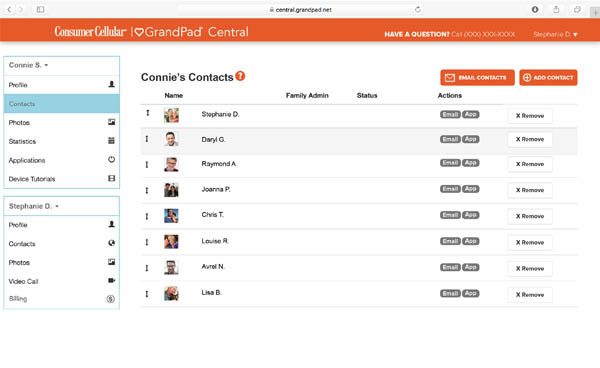 Conveniently manage the GrandPad’s authorized contacts and personalized content from GrandPad Central. Manage GrandPad through either the GrandPad Central web portal or smartphone app to assure a safe, secure experience. 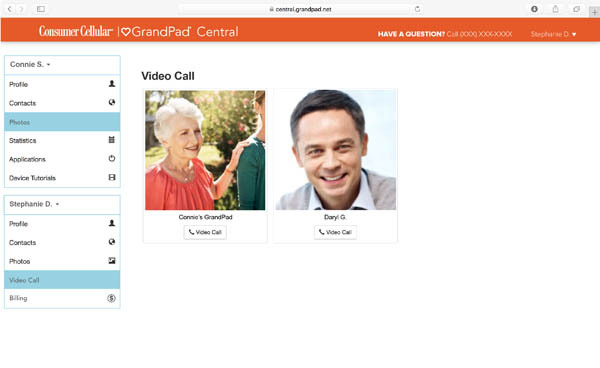 Add approved contacts, manage Internet access, upload photos and music, add or remove apps based on the user’s preferences, and even monitor usage to make sure Mom & Dad are active and enjoying the GrandPad. 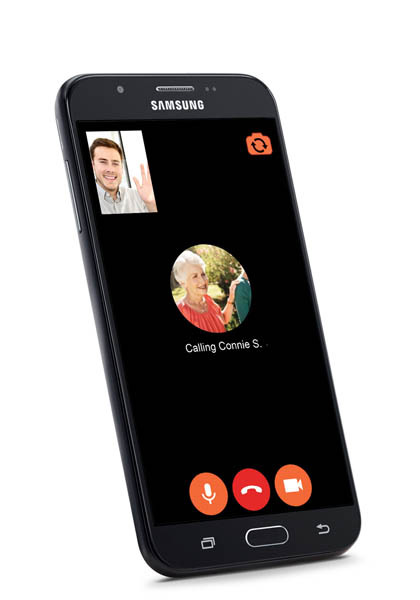 Family and friends are approved to connect with your loved ones’ GrandPad via an iOS or Android compatible app, so they can conveniently make video calls, and share photos and videos, using their cellphone or tablet. For most devices, if the unique download link provided by the Family Administrator is used to install the app, log in is automatic. 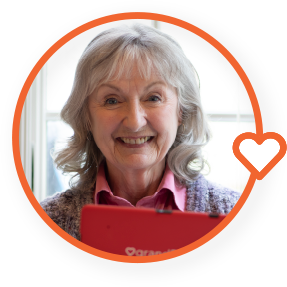 Companions can connect with GrandPad users anywhere, anytime using their mobile device. Social media feeds can be connected to GrandPad network so public updates are instantly shared across platforms. Companion can see and add comments on photos and videos posted to the GrandPad by others. App is available as a free download for both iOS and Android devices. 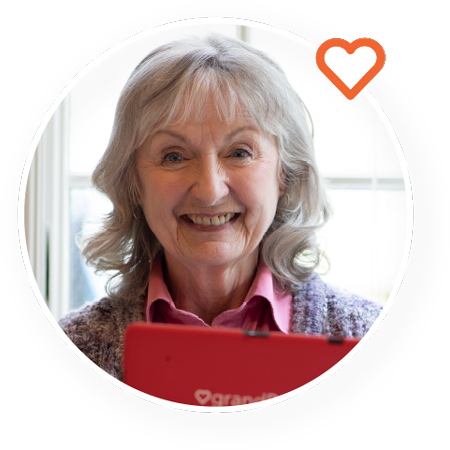 GrandPad delivers freedom from the loneliness and isolation that can often accompany aging. 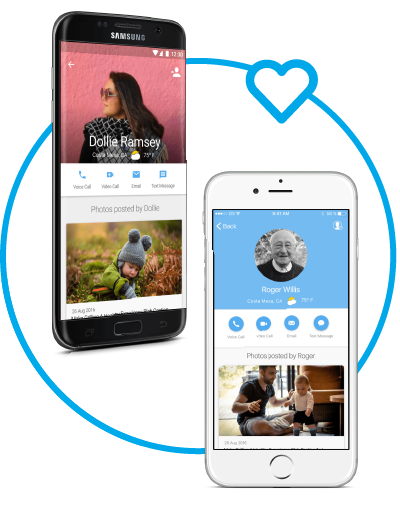 Once you’ve introduce Mom or Dad to GrandPad, they’ll be able to keep in touch the same way you do, even if they’ve had little or no experience with smartphones, computers, or tablets. They’ll be delighted with all the ways they can use it to stay active and entertained, and you’ll rest easy knowing they are safely engaged with the comforts of family, friends, and familiar activities. They’ll love all the ways they can stay active and in touch. 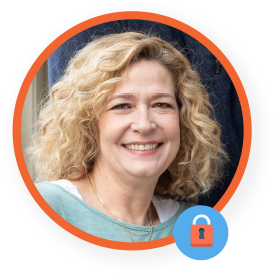 Using GrandPad Central, your family administrator invites family and friends, adds personalized content, and assures that Mom and Dad remain engaged—and secure. 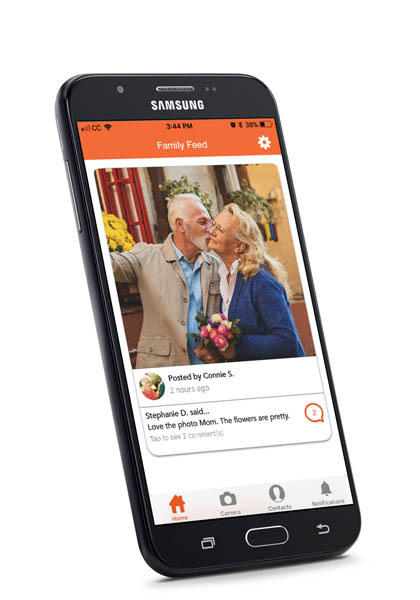 Family members and friends can share special moments by uploading photos or messages, and video chatting with Mom or Dad using the free smartphone app. 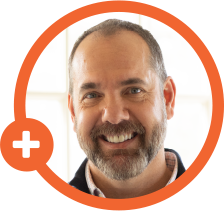 A family administrator manages the GrandPad through a web portal or handy smartphone app to assure a safe, secure experience. 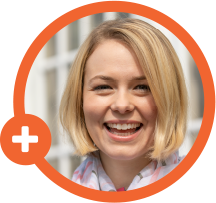 Creating a private circle lets family and friends connect–and keeps spammers and scammers away! 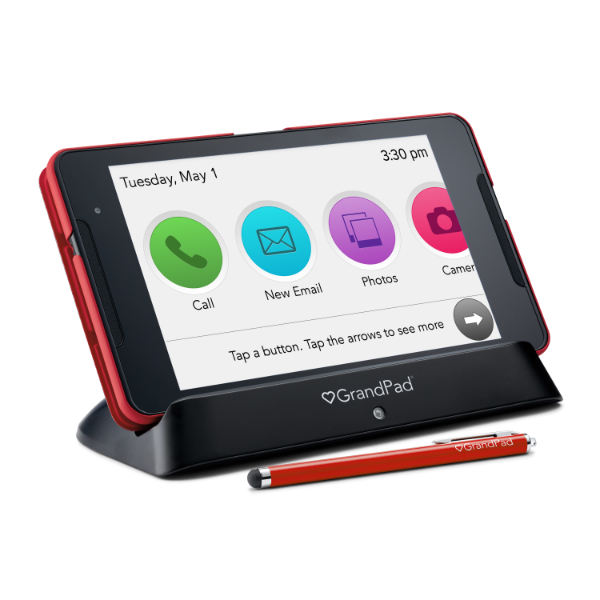 GrandPad sends alerts and messages for important events, including notification if the device has not been in use. No dialing or typing required—just touch the screen. 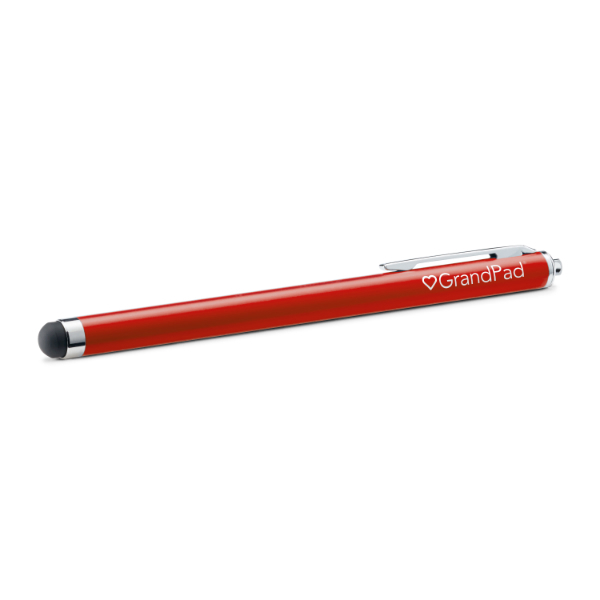 Large fonts and buttons make GrandPad easy to see and navigate. The smart case turns off the screen when GrandPad is not in use. There are no wires—the charging cradle is simple to use. 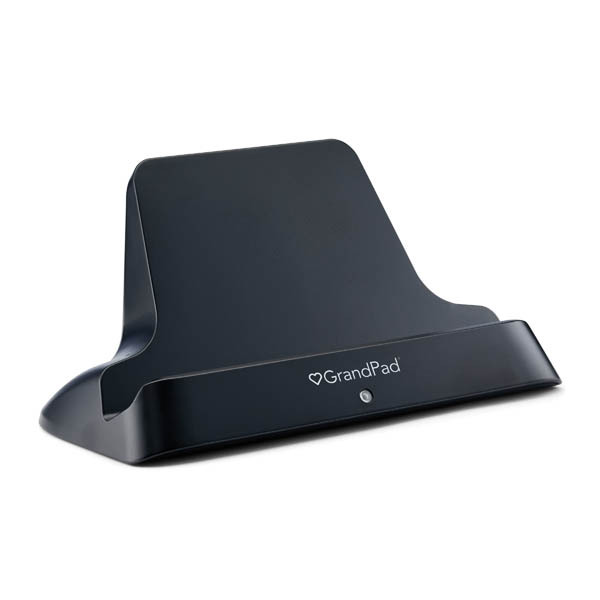 GRANDPAD COMES COMPLETE WITH EVERYTHING YOU NEED, AND THE SERVICE TO SUPPORT IT. 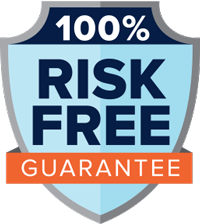 When we say “try us risk-free,” we mean it. If you’re not satisfied within 30 days, cancel and pay nothing. It’s completely hassle-free! 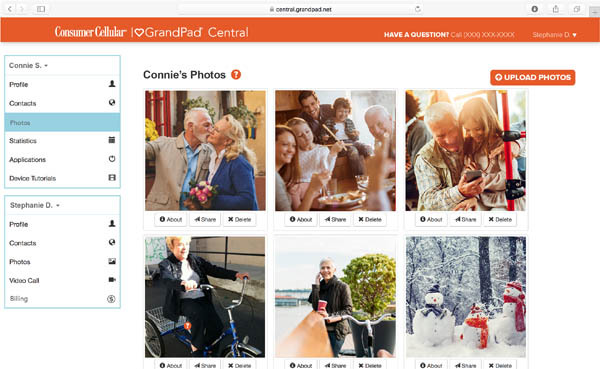 Manage content, connections, and more for your loved one through GrandPad Central. 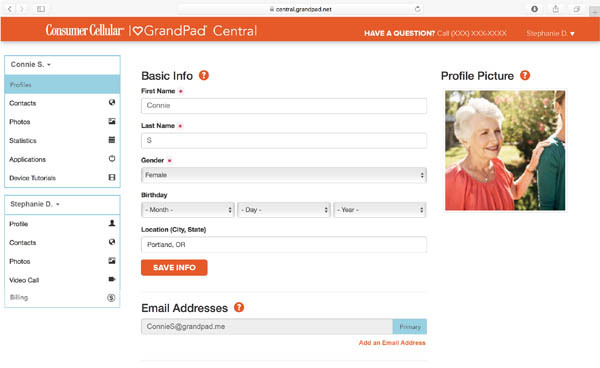 A convenient, centralized page lets you customize information for the GrandPad user, including their photo, contact information, and more. 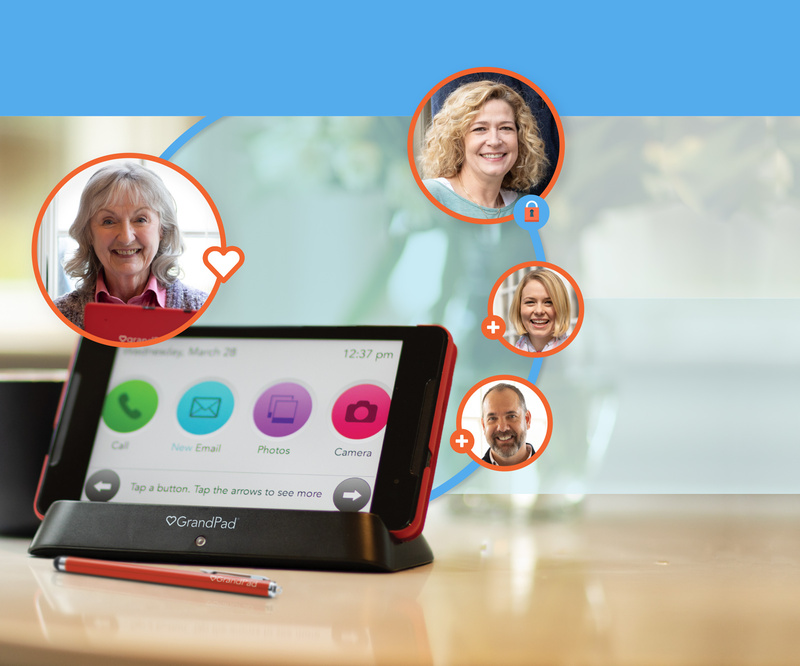 Let the whole family stay connected by adding users who can then stay in touch with the GrandPad user through calls, emails, and photo sharing. Because it is a secure family network, you’ll never need to worry about unwanted spam and other unsafe communications reaching your loved one. 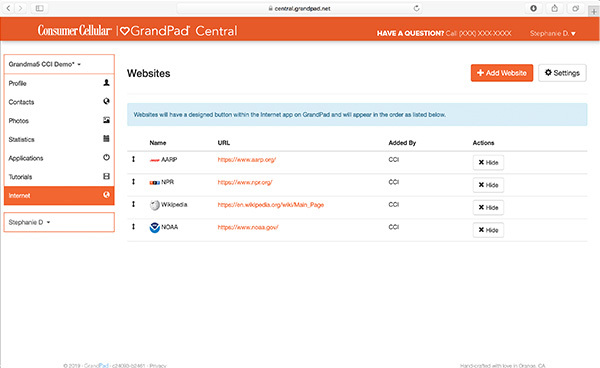 GrandPad features an Internet browser. Through GrandPad Central, customized settings can be applied for added user security. Users can be given unrestricted access to the Internet, or to a pre-selected list of favorite sites. If you prefer, Internet access can even be turned off completely. Surprise your loved one by adding cherished memories to the GrandPad’s photo library. The administrator can bulk upload photos so the device arrives with an album of family favorites, and more can be added at any time. 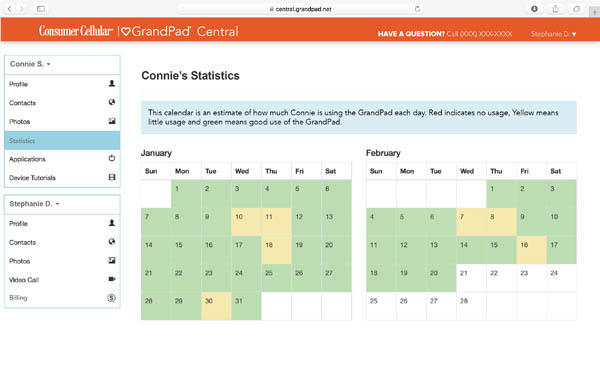 You can a monitor usage of the GrandPad to be sure your loved one is enjoying it, and also to be aware of any sudden decrease in activity that may be of concern. 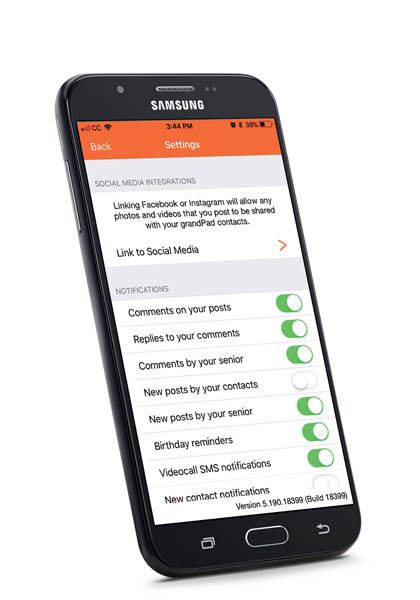 Choose notifications to receive by text, email, or both to keep you alerted to important information about the GrandPad user’s activities. 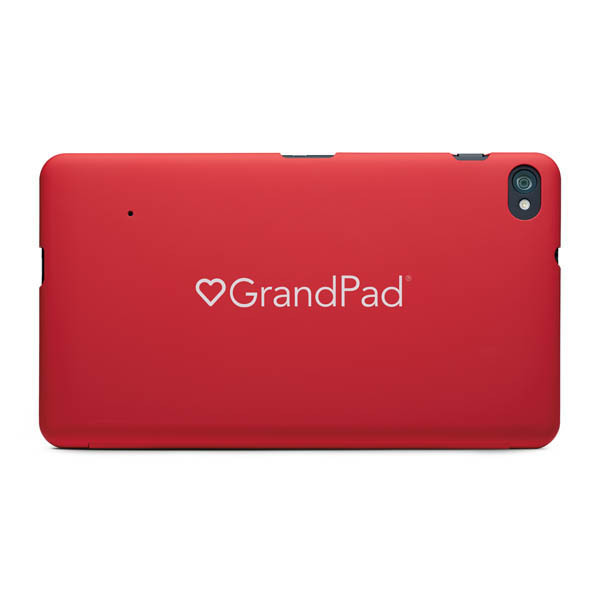 GrandPad offers a variety of apps for the user to enjoy. The administrator can add or remove apps to suit the user’s preferences. There are no customer reviews for GrandPad. Be the first! Not an AARP member but always wanted to join? We can help with that, too. You can sign up for AARP membership on our checkout page to receive all these great benefits. 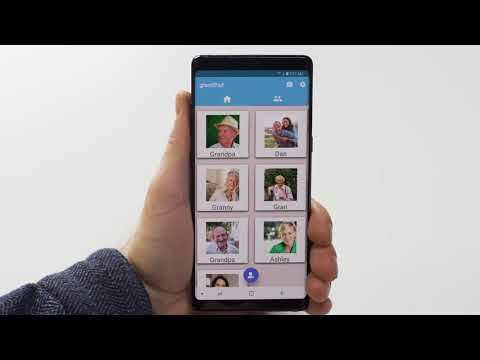 With GrandPad, your parents, grandparents, or other relatives have the tools they need to connect to family and friends with total ease. The customized tablet comes with wireless charging cradle, setup guide, and handy stylus for navigation. A monthly subscription provides the convenience of unlimited 4G LTE data, Internet browsing, ad-free unlimited streaming music, customizable security options, mobile access for caregivers and family, and more.